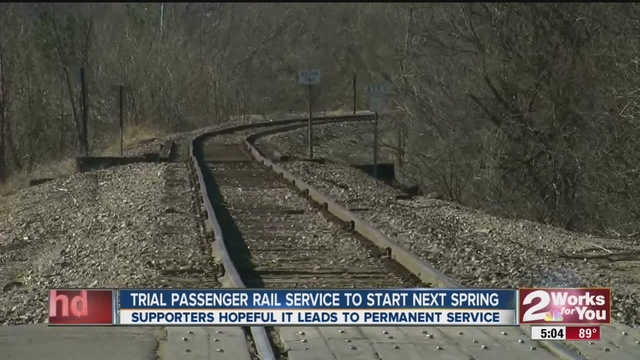 Story: Trial passenger train service to start next year, linking Tulsa and OKC metros – KJRH.com. I’ll cover the background here and will post a follow-up “soon” with the passenger-related fantasy story. The “Sooner Sub” — a subdivision being part of a railroad division usually covering a single line — was once the main line of the St Louis-San Francisco Railway between Tulsa and Oklahoma City. The SLSF was better known as the Frisco, of course, though it never made it to one of its namesake towns. In 1980, the Frisco was merged into the Burlington Northern RR. The BN merged with the Atchison, Topeka, and Santa Fe Ry in 1996 to become the Burlington Northern and Santa Fe Ry (since shortened to “BNSF“, presumably to save on paint). By 1998, the BNSF no longer had use for the segment of the line from Salpulpa to Midwest City and they sold it to the Oklahoma Department of Transportation. ODOT, in turn, leased it to Watco Transportation Services, a Kansas-based shortline holding company with over 30 railroads. One of those railroads is the Stillwater Central which operated the line from the time it was sold. ODOT owns many rail lines in the state that would otherwise have been abandoned as traffic patterns and corporations changed. ODOT ownership preserves the lines which has preserved rail access for many farmers in the state. The price of most crude oil in the US is set at Cushing, Oklahoma, of all places. When you hear a price quote for a barrel of oil it is usually the price that a producer gets when that oil is delivered to the tank and pipeline wonderland known as Cushing. Cushing hasn’t had direct rail service in decades but Stroud, Oklahoma, is pretty close by and the Sooner Sub runs through town along what used to be Route 66. There is a small railroad oil terminal there with a pipeline to Cushing. Oil has been delivered to Stroud to move to the terminal for many years. Once oil hit $100/bbl a few years back, and it became profitable to use unconventional techniques to extract oil (think hydraulic fracturing), there was a lot of oil moving to Cushing. Since the Bakken Formation in and near North Dakota has no pipelines, BNSF, the major railway in the area, has been awash in oil. The railway has been running crude oil unit trains from there to various points as fast as it can for the last several years. To get back to the story, a year or so back, ODOT invited bids to buy the line. Both WATCO and BNSF submitted bids. I’ll continue this in Part Deux, but, spoiler alert, BNSF didn’t win. This was post number 100, by the way.